Are you looking for an evergreen shrub with showy flowers in the fall or winter? Look no further than an old Southern favorite, the camellia. Large camellias dot landscapes of historic homes throughout the Florida Panhandle, and although they look like they’ve been here forever camellias are not native to North America, but were originally brought here from Asia in 1797. There are many different types, but the most common camellias found in Florida are Camellia sasanqua which bloom in the fall (October – December) and Camellia japonica with larger leaves and a later bloom time of January through March. Some other types of camellias are Camellia reticulata, C. hiemalis, C. vernails and their hybrids; and Camellia sinensis is the source of tea which is made from the young leaves of this plant. Flower colors range from a crisp white to a deep crimson and there are even some cultivars with variegated flowers! There are six recognized flower forms and they are single, semi-double, anemone, peony, formal double, and rose form double. Although most camellias have the potential to get over ten feet tall and five feet wide, there are some that grow slower and can be maintained at lower heights. Camellia sasanqua ‘Bonanza’ and C. sasanqua ‘Shishi Gashira’ have more horizontal branching habits and can be kept under five feet tall, however they will need more width than a more upright growing camellia. When choosing a site for your camellia, look for an area with light shade, good air flow, and well-drained soil. Test your soil to determine pH and fertilizer needs before planting; soil testing kits can be picked up at your local county extension office. Camellias prefer acidic soil with a target pH range of 5.0 to 6.5, and benefit from organic matter amendments in sandy soil. 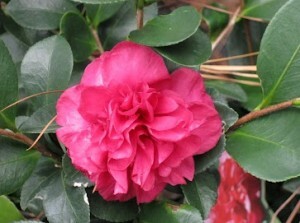 Plant camellias slightly higher than the natural grade; dig a hole that is wide and shallow. After planting check that the top of the root ball is one to two inches above the soil line to allow for some settling. Mulching helps to conserve moisture and regulate soil temperatures, but be careful not to cover the root ball with thick mulch layers. 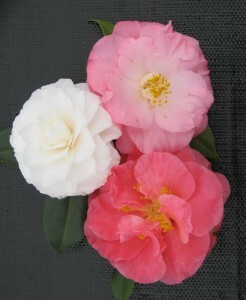 For more information about camellias and their care in Florida, please see Camellias at a Glance at http://edis.ifas.ufl.edu/pdffiles/EP/EP00200.pdf . A hidden surprise in many gardens this time of year are the delicate blooms of terrestrial orchids. 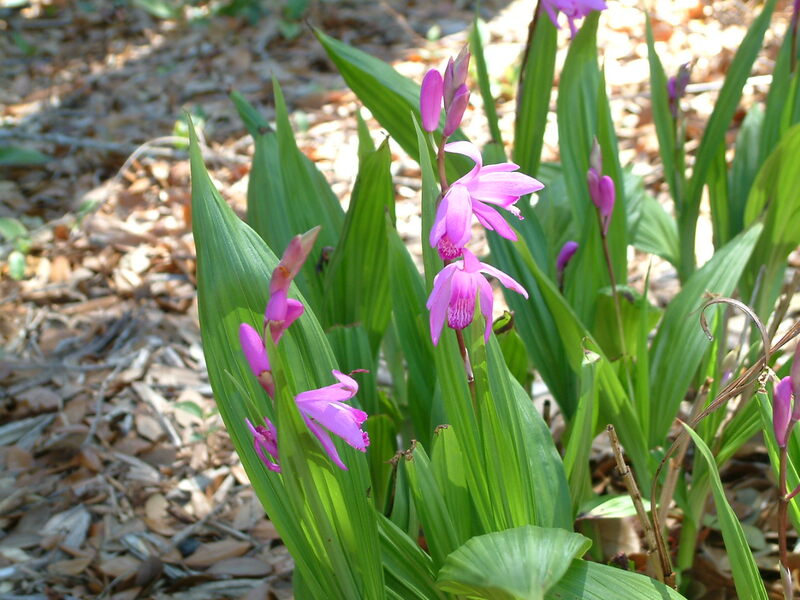 One species that is a consistent bloomer along the Gulf Coast is the Chinese ground orchid, Bletilla striata. Although foliage and flowers may be sensitive to cold weather, the preferred growing conditions under tree canopies often offer this plant protection during many winters. Flower spikes emerge from the underground structures and hold numerous bright pink flowers about 12-15 inches high. Strap-like foliage is bright green and makes an effective groundcover for the remainder of the season. It is important that the ground orchids have rich soil with some moisture. Local sandy soils may need amendments with composted materials. Each season, the clump of ground orchids will continue to expand so you can divide them in late summer for a new planting or to share with friends. Cool days and chilly nights are just the kind of weather lettuce enjoys. Lettuce is a vegetable that is extremely easy to grow, delicious and so attractive that any gardener – whether you have a vegetable garden, flower garden or even a garden in containers on a balcony – should include it in the garden. Vegetable gardening in containers for balconies and other small areas is an interesting topic in and of itself. Dr James Stephens of the University of Florida has an excellent article you can find here about growing vegetables in small containers here in Florida. According to references, lettuces were cultivated 3,000 years ago by the Babylonians and possibly earlier by the Chinese. Lettuce seeds were sealed in Egyptian tombs, and lettuces were served to Roman emperors. On European tables during the Middle Ages, lettuce was mostly eaten hot. By 1865 seed companies offered 113 kinds to America’s gardeners. Today lettuce is so popular that new and interesting varieties of lettuce appear in seed catalogs every year. Although you may read about cultivating lettuce during the summer in northern states, our summer temperatures are way too high for lettuce to endure them. Lettuce is a cool-season crop here in North Florida. Our planting season extends from September through March, with harvest ending in May. Garden lettuces can be divided into three classes based on habit of growth – leaf or looseleaf types, semi-heading types such as butterhead and romaine (or cos) and heading or crisphead types. 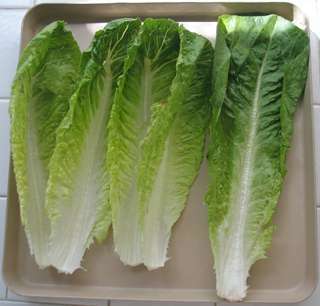 Crisphead lettuces, such as the iceberg types available in supermarkets, are more of a challenge to grow here, so I recommend that you stay with the leaf and semi heading cultivars. Other than avoiding the heading types, feel free to try just about any cultivar that strikes your fancy. Leaf lettuces are the most decorative, least demanding, and among the most heat-tolerant lettuces we can grow. This type of lettuce grows in a loose rosette of foliage, and the leaves can be smooth or crinkled, pointed, lobed, curled or ruffled. Foliage color runs from deep ruby red to dark green to pale greenish yellow, with just about every combination in between. Leaf lettuces are fast maturing and can be ready to begin harvesting just 40 days after planting. Harvesting is best done by cropping the plants regularly. When cropping, only the largest leaves are removed, which allows the plants to continue to grow and produce. A bed of leaf lettuce harvested this way can produce salads for a month or more. With that in mind, it’s a good idea to plant several crops in succession through the growing season for continued harvests. The butterhead lettuces have soft, tender leaves and relatively loose heads. Their fragile leaves make them difficult to ship and pricey at the supermarket. But these delicious butterheads are quite easy to grow. They can be harvested by cropping, or an entire plant may be harvested as the center leaves grow over and form a loose head. Varieties to choose include Bibb and Buttercrunch. Romaine, or cos, lettuces are tall, upright and thick-leaved; their thick midribs and sweet, juicy texture have made them especially prized for salads. They range in size from tiny 8-inch heads to large heads that can reach well over a foot tall. The foliage can be red or green, smooth or ruffled. Romaine lettuces are especially prized for salads. Lettuce transplants of various types generally are available in area nurseries and can be planted now through late March. You will find a much larger selection of cultivars available from seeds, which may be obtained locally in seed racks or from mail-order companies. Plant lettuce seeds into well-prepared beds that have been amended by digging in a 2-inch layer of organic matter, such as compost or rotted manure, and an all-purpose granular fertilizer. Lettuce seeds need light to germinate, so they are simply pressed or lightly raked into the soil surface. Water frequently until they germinate, and once they come up thin the plants to the appropriate spacing. The average spacing is about 10 inches between plants. For best quality, lettuce must be encouraged to grow rapidly. This is accomplished by keeping the plants well watered and fertilized. Water thoroughly during dry weather, and keep the plants mulched to prevent drought stress. Side-dress with granular fertilizer every six weeks or apply a soluble 20-20-20 every two weeks during the growing season. Stress from drought, heat or low fertility encourages the lettuce to become bitter. Even though lettuce is best grown here in the winter, hard freezes can damage the foliage. If temperatures in the mid-20s or lower are predicted, throw a layer of pine straw or sheets of fabric over the plants to prevent frost burn. Lettuce is wonderful harvested moments before the dressing is applied and the salad is served. Looseleaf lettuce is best harvested by cropping. Butterhead can be harvested by cropping or cutting the entire plant, and romaine is best if the entire plant is harvested when ready. All lettuce should be harvested by early to mid-May, since high temperatures will cause the lettuce to become increasingly bitter and to bolt (send up a flower stalk). Its beauty, ease of culture and delicious foliage make lettuce an excellent choice for any gardener. Even you flower gardeners should give it a try – you’ll be glad you did. As mentioned in the article written by Carrie Stevenson last week, we celebrate Arbor Day here in Florida on January 18th this year. It’s a day we specifically set aside to celebrate and appreciate the role living trees play in improving our lives and our environment. With that in mind, many people plant trees to celebrate the occasion and this time of the year is, without a doubt, the perfect time to plant additions to our landscape and what could be better than selecting a tree that actually flowers in the spring to add some panache. One of the best reasons for choosing a flowering tree is they will add so much color and beauty to our landscapes over the next few months. Throughout this article I am going to mention some of my favorite trees that do very well in this area and list some of the reasons I find those listed here remarkable. Do understand though, this is not a complete list of all the flowering trees, just several that I personally find remarkable and worth mentioning. A University of Florida EDIS publication written by Dr. Gary Knox that can be found here lists many more flowering trees that do well here in North Florida. In addition there is a book, The Southern Gardener’s Book of Lists, written by Lois Trigg Chaplin which includes many more that will do very well in this area. One of my personal favorites is the Red Maple. At 40 feet tall, this is one of the largest of the spring-flowering trees (Acer rubrum), and it is coming into bloom right about now. This tree species separates the sexes into individual plants, so there are male red maple trees and female red maple trees. It is the females that put on the more attractive display in the spring. Not only are their flowers more showy, but those flowers turn into attractive fruit. You may notice these trees in your area – with their deep-red, burgundy or rusty-red, boomerang-shaped fruit clustered all along their leafless branches. The red maple also makes an excellent shade tree. Although it can grow in wet areas, it adapts readily to well-drained urban landscapes. It is a deciduous tree with an upright oval shape and a moderate to fast rate of growth. Another choice, the Taiwan flowering cherry (Prunus campanulata), produces deep pink in great abundance before the leaves emerge. Flowering generally begins in mid- to late January and extends over two to three weeks. This is one of the few flowering cherries that grows and blooms reliably this far south. It prefers to grow in a sunny to partly sunny location with excellent drainage. The ‘Okame’ flowering cherry is another type that will grow successfully in North Florida. Pale pink flowers are produced in March or April. The Oriental magnolia (Magnolia x soulangiana) is one of the most spectacular of the spring-flowering trees because its flowers are so large. Unlike the evergreen Southern magnolia, the Oriental magnolia is deciduous and loses its leaves in winter. Appearing in January and February before the foliage comes back, the fragrant flowers are tulip-shaped, 4 inches to 6 inches across and may be flushed pale pink to purple on the outside and white on the inside. Long-lived and reliable, Oriental magnolias grow 15 feet to 20 feet tall and need a sunny location with good drainage. The related star magnolia (Magnolia stellata) is smaller, growing 10 feet to 12 feet tall, and is more shrub-like. Its white or pale pink flowers are star-shaped and wonderfully fragrant. Blooming in late January or February before the foliage reappears, the star magnolia is an excellent choice for small space gardens. The native silver bell (Halesia diptera) is a lovely tree that is often recommended as a substitute for dogwoods and is less fussy about its growing conditions. The trees do not really resemble each other that closely, but the silver bell does bloom at about the same time with small, four-petal, white flowers that hang down in large numbers from the branches. The thin leaves allow light to filter through, creating a lovely effect under the tree. They grow well with light shade or in full sun and mature at about 25 feet to 30 feet. The hawthorns are a wonderful group of native trees that provide spring bloom as well as fruit for human or wildlife consumption. One of my favorites is the parsley hawthorn (Crataegus marshallii). Growing 15 feet to 20 feet tall, it is an excellent choice in patio or small space plantings. The clusters of white flowers appear in March or April and are soon followed by the foliage, which looks like flat Italian parsley, hence the tree’s name. The small red fruit that ripen in fall are relished by mocking birds. Parsley hawthorn is tolerant of poorly drained soils and grows in full sun to part shade. When the trees are young they possess thorns. Fringe tree (Chionanthus virginicus) is a delightful native tree that thrives in well-drained locations with full sun to partial shade. The flowers are greenish white and are produced in masses all along the branches. The narrow petals and hanging habit give the flowers a fringe or beard-like appearance. In the wild you usually see them growing on the edge of the woods. The Chinese fringe tree (Chionanthus retusus) also grows well here and is even showier than our native species. Master Gardeners demonstrate correct tree planting techniques. Arbor Day (which literally means, “Tree Day”) was founded in 1872 by J. Sterling Morton, a naturalist and journalist in Nebraska. By 1882, it was celebrated by thousands of schoolchildren nationwide, who planted trees and took care of them with their classmates. Today, millions of communities and schools celebrate Arbor Day all over the world. Trees provide endless benefits, including shade, recreation, food and building products, wildlife habitat, oxygen production, and carbon dioxide uptake. 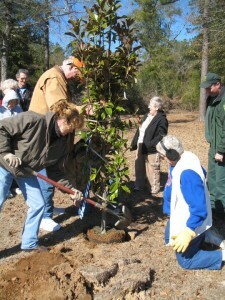 Click here to find more information about ways to celebrate Arbor Day.